Graham Ryder was a premier lunar scientist who pioneered many of our most important concepts about the Moon and its evolution. Graham passed away on January 5, 2002, as a result of complications from cancer of the esophagus. He received his B.Sc. 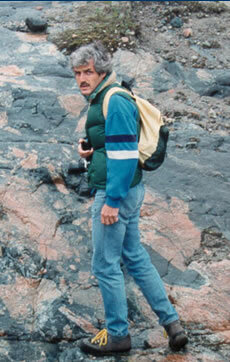 from the University of Wales (Swansea) (1970) and his Ph.D. from Michigan State University (1974), specializing in the petrology of igneous rocks. He did post-doctoral study with John Wood's group at the Smithsonian Astrophysical Observatory, was subsequently employed by Northrup Services Inc. in the Lunar Curatorial Facility at NASA Johnson Space Center, and since 1983, has been a Staff Scientist at the Lunar and Planetary Institute in Houston. Graham's work was instrumental in several areas of lunar science. He was among the first to recognize evidence in the lunar sample collection that mare volcanism began very early, before the end of the "late heavy bombardment." Graham's work with highland rocks and breccias clarified the processes and history of the lunar crust. He produced detailed catalogs and guides to the Apollo lunar sample collections, facilitating the scientific work of the entire sample community. As a result of these efforts, he was intimately familiar with the sample collections and could recite detailed characteristics of various samples and the results of studies associated with each. Graham's work helped provide the basis for understanding the geological context and petrological characteristics of the samples, which greatly advanced our understanding of the Moon's evolution. As part of his interest in the geological process of impact, Graham studied terrestrial impact breccias and melts and fully participated in the revolution in terrestrial geology that resulted from study of the Cretaceous-Tertiary impact and subsequent mass extinction. In recent years, Graham became interested in the problem of the early cratering history of the Moon (the so-called "lunar cataclysm") and undertook to obtain very precise radiometric ages of lunar impact melts to address this problem. This work produced revised estimates for the ages of major lunar impact events, a set of data that must be explained to unravel fully lunar history. Graham's quick wit and insightful commentary enlivened many of the scientific meetings he organized, convened, and attended over the course of his career. Discussions that veered off track were soon brought back to point by Graham's encyclopedic knowledge of the sample collection. Graham thoroughly enjoyed the give and take of serious scientific debate, but he also enjoyed mischievously skewering pomposity, questioning conventional wisdom, and reminding the community of inconvenient facts and constraints on newly proposed "syntheses" and models. Graham is survived by his daughter Abigail, his parents and siblings in England, and hundreds of friends and colleagues around the world. Lunar science has benefited greatly from Graham's work and our lives have been enriched by his presence. We will miss him.